Earnest Eugene "Gene" Rory, of Quincy, FL, departed this life on Friday, March 16, 2018. He leaves to cherish his precious memories: a loving and devoted wife, Willie Joyce Glynn Denis Rory, of Quincy, FL; sons, John Bell (fiancee. Cyntrell Davis), and Tommy Denis, Jr. (Barbara), both of Tallahassee, FL; sisters, Cynthia Dubois,of Quincy, FL, Callie Gunn (Timothy), Deneen Wright, and Patricia McDonald (Glen), all of St. Petersburg, FL; father, Lester Rory, Sr., of Baltimore, MD; brothers, Oscar Rory (Teresa), of Valdosta, GA, Reese Rory (Diane), and Tyrone Smith, both of Baltimore, MD; sisters, Vanessa Tatum (William), Jacqueline Smith, and Tonya Simms (Nay), all of Baltimore, MD; 17 grandchildren; 6 great-grandchildren; and a host of other relatives and friends. Visitation will be held on Monday, March 26, 2018, 3-7 p.m., at the mortuary. A celebration of celebration will be held on Tuesday, March 27, 2018, 11:00 a.m., at Tabernacle C.O.C.W.I.H., 12425 Blue Star Highway, Gretna. Internment: Tallahassee National Cemetery. WILLIAMS FUNERAL HOME is providing services for the Rory family. 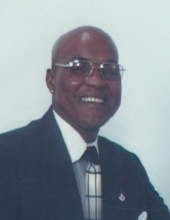 To plant a tree in memory of Earnest Eugene Rory, please visit our Tribute Store. "Email Address" would like to share the life celebration of Earnest Eugene Rory. Click on the "link" to go to share a favorite memory or leave a condolence message for the family.